One of the most exciting parts about camping is the food! However, the idea of hunching your back to dine is not comforting at all. The best solution to this is to own a camping table. You might already have tools such as backpacking tent or camping tent, camping cot, air mattress, or wearable sleeping bag. But a camping table will make your activities (eating, working, gathering, etc.) at the camping more enjoyable. Our team has spent a considerable amount of time in testing/researching about the best, top-rated camping tables in 2019. And, as an end result, we have compiled the ultimate list of the top 10 best camping tables below. With this list, you’ll be able to pick up the perfect camping table for your next trip. First off, this is the classic piece, the ALPS Mountaineering Eclipse Table. It comes in 2 colors, khaki and checker board pattern. And, it is crafted with a very sturdy construction. The camping table has 2 levels. Its top level is for placing food and playing games while the bottom level has 4 built-in beverage holders and a side pocket organizer, for storing all your extra items. With the corner buckle design, this camping tableware provides easy and quick set-up as well as adjustable tautness. This portable picnic table weighs around 7 lbs. The purchase also includes an 8×36″ shoulder carry bag for you to use. Plus, the price tag is just unbeatable, too. Coleman Outdoor Compact Table is a family size portable, fold up table that can serve up to 4 people. Thanks to the steel frame and aluminum top – this table is not only a portable item; it is also a sturdy, lightweight, and compact camping table. With the carry case provided, you can hold this lightweight camping table at ease. The case fits in almost any car trunk. To assemble, you can simply snap the frame and the top together. Next, we would like to recommend to you the ALPS Mountaineering Dining Table. 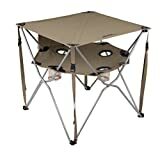 With a weight of only 12 lbs and a foldable top, this camp table is very lightweight and versatile. This camping table is surprisingly very sturdy. It is tough enough to hold a dishwashing tub or a water container! On top of that, this fold up table is space-saving, and easy to assemble. Plus, the carry bag that comes with the purchase can come in pretty handy, too. Here, we are looking at another well-reviewed camping table, the GCI Outdoor Slim Fold Table. . If you need a heavy-duty outdoor folding table, feast you eyes on this one. Crafted with aluminum counter top and powder-coated steel frame, this camping table is definitely a well-made table built to last! 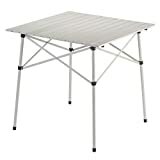 This table is capable of holding a variety of camping and dining necessities such as utensils, beverages, glasses, garbage bags, and paper towels. 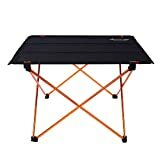 In addition to being a foldable camping table, this table also functions as a convenient cook station that has 1 storage rack, and 4 multi-use side tables. What about something a little extra this time? This Coleman Pack-Away Kitchen is not just an ordinary camping table. It is a pack-away kitchen that comes with hanging hooks, a lantern hook and a mesh shelf. Interestingly, this portable picnic table is designed for the utmost versatility. This camp table is suitable for almost all kinds of Coleman stoves. Now, you are able to bring a pack-away kitchen with you the next time you camp. How awesome is that! As one of the most-loved camping tables of all time, this is a table from Coleman that we can utilize separately, and in various ways. Serving as compact, versatile portable picnic table, this item is a kitchen table, a work desk, a nightstand, a food prep surface, a dishwashing table, and any other table item you can think of! Capable of providing 4 heights, these 2 tables can either be used by placing end-to-end to create a long buffet table, or side-by-side to form a classic square dining table. Plus, what a great table offered at a great price! Here, we are looking at an outstanding camping table from Trekology. In addition to being compact and foldable, thanks to the 600D nylon tabletop, this camping table is amazingly durable, lightweight, ultra-flat and stable. It weighs only 17.75 lbs! On top of that, its gorgeous metallic look makes this camp table very appealing. Plus, assembling this table up is a snap. Another recommendation from us is this compact roll-top side table from Kamp Rite. As its name suggests, this camp table is certainly designed for a quick and easy set up. Thanks to the heavy-gauge aluminum tube frame and water resistant aluminum roll up, this is folding camping table of the ultimate durability. Plus, the shoulder-strapped carry can come in very handy when it comes to portability. Such features and performance has made many customers come back for the second and third purchase already! At a glance, we can tell that this is an attractive camping table that is sleek and elegant. Beauty is not all this table presents; this is a convenient camping/grilling table from Camco that is foldable, easy to set up, and lightweight. 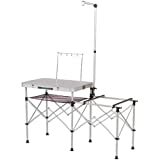 In addition, providing so much room, the portable picnic table offers dozens of hooks for holding paper towels, utensils, or any other camping necessities. As a multifunctional folding camping table, you can either use it for eating or cooking for the fact that its top surface can hold a griller at ease. Are you ready to camp stylishly with this Camco Deluxe Camping Table? Keeping the best for this last, we are excited to introduce to you a magnificent yet affordable camping table from Sportneer. 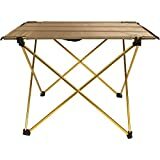 As a sturdy piece, this lovely, metallic camping table can hold up to 35 lbs of weight! On top of that, this outdoor folding table is reputable for its amazing price, ease of transport, dynamic quality, lightweight, and easy set up. One thing that Sportneer also takes into consideration while other companies have missed is the fact that the table is rust-free, too. When camping, we all know how moisture and rain can make a camping table become rusty. So, being rust-free is actually a significant feature of a camp table. 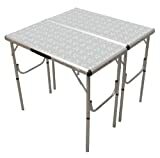 Plus, with such an affordable price tag, everyone should put this Sportneer Camping Table into consideration. We just walked you through a curated list of the top 10 best camping tables in the market today. A camping table can make or break the fun experience, and any of these camping tables will never disappoints! Which one is most favorite?